If your query includes a single word or it's an expression, Google links to the definition in the blue bar that mentions the number of results. Initially, Google linked to dictionary.com, then it switched to answers.com and now it uses its own service: Google Dictionary. As mentioned in January, Google updated the English dictionary with synonyms, antonyms, pronunciations, detailed definitions and examples from Collins COBUILD Advanced Learner's English Dictionary. Google's dictionary lists the most recent 5 searches, you can star words, find related words and definitions from the Web. In 2007, Answers.com's CEO said that "there's no deal between Google and Answers.com for the definition links. Google picked Answers.com because it thought Answers.com was a good resource, not because the two companies had negotiated any placement." Google Dictionary is not a perfect replacement for Answers.com because it doesn't include information from encyclopedias. Some people might miss Answers.com's reference pages that aggregated information from many reputable sources, but those who clicked on Google's definition links to read definitions and to find synonyms won't be very disappointed. lol, how long till all of Googles search results are Google websites? Maybe the Answers.com and others might have gone "Murdoched" :-) asking for money and Google would have decided to go on its own way like they did with the maps services. But there is another key point in Google Dictionary, it is the language translation option and their pronunciation, related phrases, web definitions etc, which is unique I think compared to other word definition services. Here is an example. I also noticed that some of the English dictionary entries have pronunciation audio as well (in addition to the translation English audio mentioned by @cgull. Its odd that this would be one of the only audio examples I can find because "ginormous" is not necessarily a "real" word, but is commonly used in pop culture for a cross between enormous and gigantic. There seems to be audio for British English and audio for American English. I'm guessing it was an oversight since they clearly have the data. A much better reference search is Onelook.com. It searches all reference material at once. I've used it for 10 years and love it. QUOTE: "...but those who clicked on Google's definition links to read definitions and to find synonyms won't be very disappointed." I strongly disagree. Answers.com was and is still far superior to that of Google's dictionary. GIVE US A CHOICE, GOOGLE! Who puts the definitions on Google is what I want to know.... I have a siting sources school project so please help! Does a group do it? Or a person? Maybe a dictionary? PLEASE REPLY ASAP! Thanks so Much! The post already answers your question: the Google's English dictionary gets the definitions from Collins COBUILD Advanced Learner's English Dictionary. 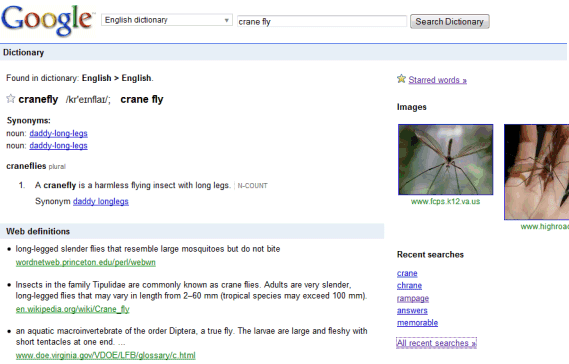 Web definitions are automatically extracted from web pages (mostly from glossaries). Google Dictionary is still there. Just add "define" to your query or select "Dictionary" from the search options sidebar.